Scotland’s rugged west coast is, I would suggest, uniformly magnificent. And yet, as you travel through this amazing place there are some locations that rise above even that lofty baseline. Some are famous, most are not. And in the case of the nots, they’re often the kinds of places you unwittingly stumble upon while on your way to see something else. 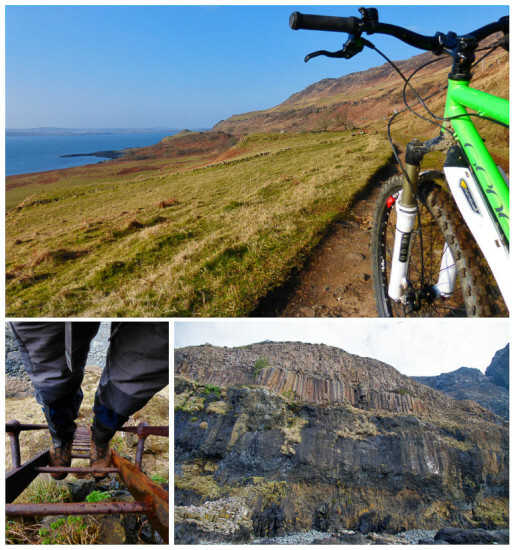 As a case in point, earlier this year I paid my first ever visit to the Isle of Mull. I’d heard plenty in advance about its history, its hills and its geology, so I already had a list of things I wanted to do. The romantic in me wanted to see Iona. The hillwalker wanted to climb Ben More. But the geologist in me really wanted to see MacCulloch’s fossil tree. All three were exciting prospects but the fossil tree stirred my imagination that little bit more by virtue of its remote location, out on the westernmost tip of the impenetrable Ardmeanach peninsula. It was somewhere I’d not even heard of before I arrived on Mull but, crucially, the island’s reputation for coastal landscapes so immense that you’d need cranes and winches to lift your jaw off the floor, had also managed to pass me by. Ardmeanach (Ard Meanach, Middle Promontory) is somewhere that manages to deter all but the most determined of daytrippers. That possibly goes some way to explaining why it’s not well known beyond Mull’s shores and, like so many of Scotland’s most spectacular landscapes, it has volcanism to thank for its impenetrability. It is the product of the same period of volcanic upheaval that shaped Skye and Ardnamurchan, around 60 million years ago when Greenland pulled away from Europe. The resulting stresses tore open great fissures in the earth’s surface, allowing molten rock to escape from below. The lava wasn’t ejected in an explosive volcanic eruption like those of Vesuvius or Mount St Helens, rather it was relatively gentle, pouring out of fissures. There were periods of quiet in between eruptions, which allowed each lava flow to cool and solidify before being covered by the next. By the time the volcanic activity subsided, much of what is now Mull was covered by a lava plateau up to 2km thick, composed of layer upon layer of different lava flows, each up to 15m thick. That hard volcanic rock has stubbornly withstood the grinding of glaciers and the march of time, but the steady attrition of its composite layers has given the peninsula a peculiar stepped appearance. Imagine building a pyramid out of Lego bricks and you get the idea. The result is a wild, inhospitable place devoid of paths, with a topography that defies easy description or access. Lofty hillsides give way to a cascade of volcanic crags, which in turn give way to towering cliffs that effectively bar all access to the rocky beaches below. Seen from Bunessan on the Ross of Mull, Ardmeanach looks every bit the impenetrable fortress. Small wonder it is marked on OS maps simply as ‘The Wilderness’. For most people, the only easy access is by hugging the coast, which ironically means you see more of the rest of Mull than you do of Ardmeanach. But perhaps ‘easy’ is overstating things. For read any guidebook and the list of obstacles you have to overcome before even setting eyes on the fossil tree makes for interesting, if disconcerting reading. It hides away in its own small cove and therefore can’t be seen until you’re just metres away from it. This involves more than five rugged miles of walking, precipitous cliffs, pathless walking over bouldery beaches, potential rockfall and landslips, a race against the tide and, to cap it all off, a descent of a vertiginous rusty ladder. For some, all of that surely spells wobbly knees. For others, it spells adventure! Most literature or blogs about the fossil tree understandably focus on the tree itself and, though they mention the walk in, they tend to gloss over the splendour of the coastline. From what little I’d gleaned about it I knew I was in for an adventure, but I’m not sure anything could have prepared me for the insane grandeur of the place. Starting at the car park at Tiroran, I trundled along the stony track on my bike towards the Burg, a National Trust for Scotland (NTS) property and one of the first that the trust acquired back in 1932. The ride in was beautiful, the road mostly downhill and swift, which gave a deceptive introduction to what lay ahead. The road petered out at the Burg and the way ahead became a smaller grassy track. I left my bike at the gate and headed on foot through the fence. It was still all quite normal at this point: closely-cropped grass; sheep; big skies; the sea below me to my left; islands on the horizon. Typical west coast really. But rounding the headland it all changed. A huge sweep of beach stretched into the distance, but there was no friendly sand to walk along. It was a beach of boulders as far as the eye could see. Beautiful on this sunny day, but rugged and austere all the same. The rough path became a mere goat track and, after the beach, the scenery grew steadily more grandiose with every rise I crested and every headland I rounded. With the sea on my left and towering cliffs on my right, every so often I had the unsettling experience of having to walk across old (but not THAT old) landslides. It felt precarious but also undeniably exciting. Before long, evidence of Ardmeanach’s volcanic upheaval appeared. 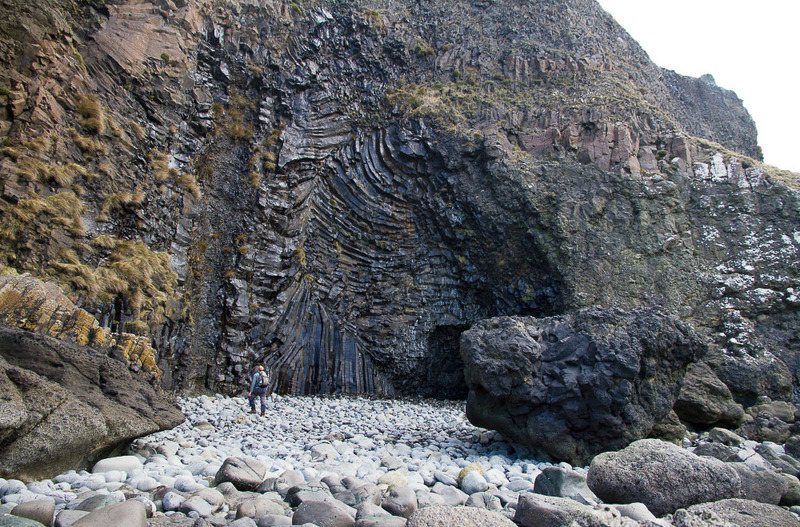 Hexagonal basalt columns, a perplexing product of cooling magma, started to appear on the rocky beach below me. On closer inspection, the whole beach was composed of the worn tops of interlocking columns. Above me, the exposed cliffs revealed the peninsula’s construction in glorious cross-section – layer upon layer of ancient lava flows – and nowhere have I seen this process laid bare quite so clearly. Each flow was perfectly discernable. Each one different in composition, structure and appearance. The path continued to skirt along the coast until, quite unexpectedly, the ground fell away in abrupt fashion as I arrived at the vertiginous ladder. But as had been so typical of this walk, no sooner had I arrived at one amazing sight, its thunder was promptly stolen by something even more impressive up ahead. 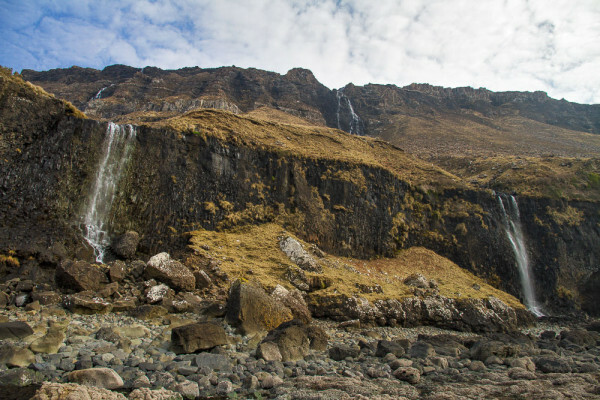 In this case, two giant waterfalls falling onto the stony beach. They were perfectly proportioned, some distance apart but of equal height, whose feeding burns you could see reaching 200m up the cliffs and eventually out of sight. I climbed down the ladder and onto the beach. 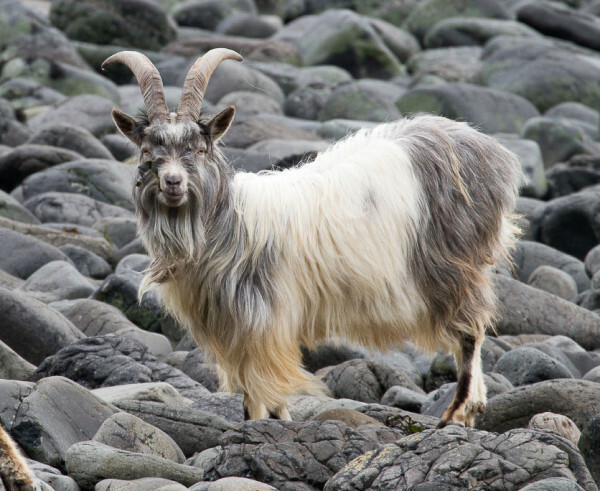 As I did so, a family of feral goats, munching on seaweed, watched me. They looked wild. Rugged. Hardy. The living embodiment of this magical place. I walked to the waterfalls, enjoying the sound of falling water and the sight of rainbows arcing through the spray. One of the falls dropped its torrent onto perfectly positioned basalt columns, its white water exaggerating their bizarre geometric shapes. It was mesmerising. With a luxuriant, wet, cascading grandeur reminiscent of the tropics, I already felt as though I was on the pages of Arthur Conan Doyle’s ‘Lost World’, circumnavigating ‘Maple White Land’ – his dinosaur-inhabited plateau surrounded by unassailable cliffs. This was immense natural splendour on a scale I’ve rarely seen in these islands. How had I been unaware of this place? I’d been expecting grandeur but I just hadn’t been expecting THIS! As I passed by lava flows, basalt columns, giant fossils, glacial features, picture perfect waterfalls and imposing cliffs, I felt like I was walking through the showroom for Planet Earth’s landscaping department. I was actually worried that the fossil might be a let down after all this grandeur, so I sat down on a rock near the waterfalls to take stock….and to take tea & cake! Given my total immersion in this Lost World, I could have been forgiven for thinking it was a pterodactyl and that I was circumnavigating Maple White Land. But I was brought back to reality by a white-tailed eagle gliding overhead, being pursued and harried by a croaking raven. That, and the ubiquitous, garish plastic litter washed up on the beach. Clearly not a pterodactyl, the eagle flipped upside down and flashed its talons in an effort to ward the raven off, to no effect. What a sight! It felt as though Ardmeanach was pulling out all the stops for today’s visitors. Not that there was anyone else around to see it, though. I saw nobody all day, which further heightened the illusion of remoteness. I returned to my cosy cottage that night feeling slightly surreal, as though I’d spent time in another world entirely. 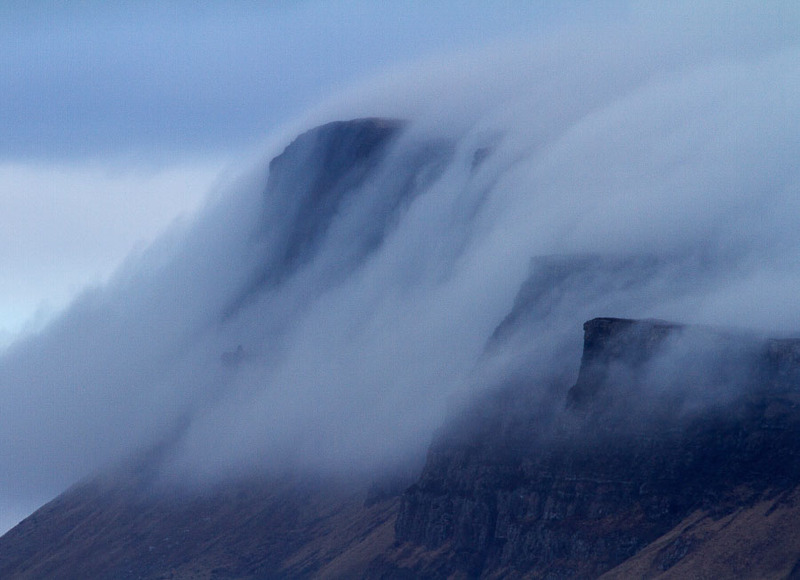 The next day, mist and rain rolled in, and from 4 miles across Loch Scridain I watched as cloud swirled up between the high cliffs of Ardmeanach. It looked immense, mysterious, every bit Conan Doyle’s Lost World. But what about the tree? Well, just a few minutes on from the waterfalls I rounded a small cliff and there it was in the cliff face. 12 metres high, tilting slightly to the right, and with a jumble of twisted basalt columns all around it. It made for a baffling sight, because what you see when you stand there isn’t recognisable as a tree as such, rather it’s the impression that the long-dead tree’s fossilised trunk has left behind. It’s reckoned that around 55 million years ago the lava creeping across the landscape encountered a tree or, more likely many thousands of trees. They wouldn’t have been trees we’re familiar with today, of course, but they were similar. Conifers, related to modern Cypress trees. This is hinted at by the scientific name given to this genus of fossils – cupressinoxylon. Upon contact with the lava the tree would have been incinerated, turned to charcoal, and its carbonised remains then managed to survive being entombed in the rapidly cooling lava. Subsequent erosion by ice, the elements and the sea has eaten away at the ancient lava flows and revealed the imprint of the tree trunk in the cliff face. It was discovered by forward-thinking geologist John MacCulloch in 1811, and described in his 1819 book, ‘A description of the Western Isles of Scotland’. I’m not sure just how much of the fossilised trunk remained in the column when MacCulloch found it, but most sources indicate there was a lot more to see in 1811. There are still some fossilised charcoal remains at the tree’s base today, but the majority has been pillaged by two centuries of sightseers and collectors. So what you see now, sadly, is a significantly diminished artefact. Never the less, the impression created in the rock is undeniably impressive. Me and the tree finally meet. Consider that, for most people, the biggest fossil they’ll have seen is a leaf or a small fragment of shellfish. This thing is HUGE, and would be an impressive sight anywhere in Scotland. But perhaps something as remarkable as this deserves only to be found in a truly remarkable place? I can’t deny that its far flung location and coastal situation, flanked by some of the grandest landscapes I’ve seen anywhere in Scotland, do lend it a romantic, splendid air all its own. I could have happily stood there for hours pondering the tree, its inconceivable age and my own piddling place in the vast scheme of things, but the sound of surf striking the shore behind me was a rude reminder of the ephemeral nature of the route I’d taken. It was time to go, lest I get stranded by the tide. I’d headed out that day in search of a fossil. But in the end, said fossil was merely the icing on a huge and unexpected cake. Encountering and being surprised by these places, typically when you’re looking for something else entirely, is one of the delights of exploring the great outdoors….and especially the west coast. It reminded me that it’s not always about the destination. It’s about the journey. And as I turned around and started to head back the way I came, I thanked my lucky stars that I got to journey around Mull’s Lost World a second time.